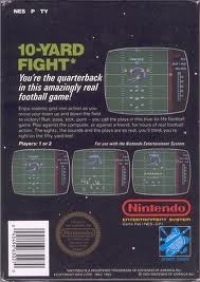 Box Text: You're the quarterback in this amazingly real football game! 05-26-2014 dawg338 Box Text You're the quarterback in this amazingly real football game! Enjoy realistic grid-iron action as you move your team up and down the field to victory! Run, pass, kick, punt -- you call the plays in this true-to-life football game. 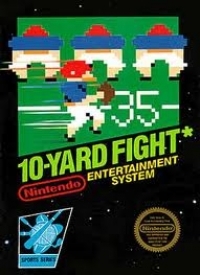 Play against the computer, or against a friend, for hours of real football action. The sights, the sounds and the plays are so real, you'll think you're right on the fifty yard line! 11-16-2012 exonerator Box Text You're the quarterback in this amazingly real football game! Enjoy realistic grid-iron action as you move your team up and down the field to victory! 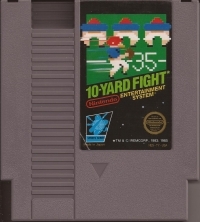 Run, pass, kick, punt -- you call the plays in this true-to-life football game. Play against the computer, or against a friend, for hours of real football action. The sights, the sounds and the plays are so real, you'll think you're right on the fifty yard line! This is a list of VGCollect users who have 10-Yard Fight (3 screw cartridge) in their Collection. This is a list of VGCollect users who have 10-Yard Fight (3 screw cartridge) in their Sell List. This is a list of VGCollect users who have 10-Yard Fight (3 screw cartridge) in their Wish List.